This latest batch of screenshots from Destineer's Stoked highlight what goes on behind the camera and in the editing booth once you've finished carving your name in the side of a mountain. 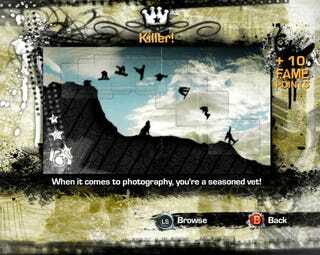 The whole point of Stoked is to get yourself fame points in order to appear in snowboarding films and magazines, and these screenshots show you how you go about earning those points. Personally I'd just rather have a good old-fashioned snowboarding title that just features you and the mountain, but if they manage to nail both tricks then who am I to complain? We'll find out how they did once Stoked gets released next month.